Since I'm going to spread my writing thin on this blog in the upcoming weeks, I thought it might be nice if I highlighted some things that were happening. So here goes. Update 2017-04-29: Forgot the coding stuff. Is now added! Recently on Google+, someone recommended Wallace Wang's Swift OS X Programming for Absolute Beginners. Well, I'm not a beginner anymore, but the book sounded fun, so I gave it a spin. And I'm quite impressed. That's why you read the review here. If you are interested in taking notes fast and reliable but never got around NV's interface, now it's the best time to reevaluate the situation. 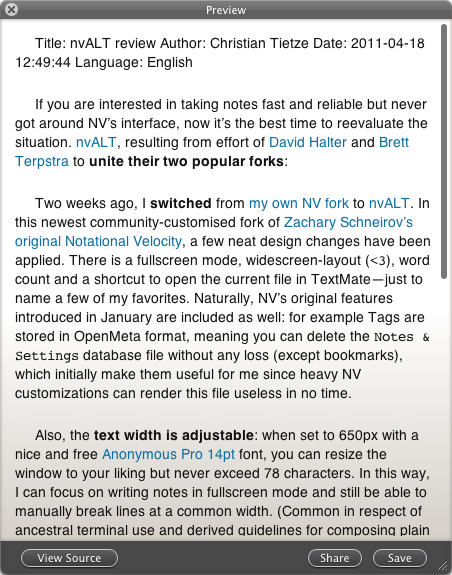 Introducing nvALT, the result of joint efforts of both David Halter and Brett Terpstra who united their two popular NV forks. Two weeks ago, I switched from my own NV fork to nvALT. In this newest community-customised fork of Zachary Schneirov's original Notational Velocity, a few neat design changes have been applied. There is a fullscreen mode, widescreen-layout (<3), word count and a shortcut to open the current file in TextMate—just to name a few of my favorites. Naturally, NV's original features introduced in January are included as well: for example Tags are stored in OpenMeta format, meaning you can delete the Notes & Settings database file without any loss (except bookmarks), which initially make them useful for me since heavy NV customizations can render this file useless in no time. There are a few issues which I'd like to fix as soon as the source code is released. The Markdown preview window style. It's default style is just not-so-stylish at all but shows what can be accomplished when the user takes some time to modify it. I'd like to tweak the default template a bit and enhance it attractivity-wise. MultiMarkdown preview rendering ignores the whole header. Thus, every note without a header is rendered quite nicely. My fork had issues with this: every document's first line or paragraph was assumed to be the header, hence not rendered at all. Now it's the opposite. There is an objectively right way just in the middle: check for existing header metadata. Switch MultiMarkdown rendering engine. Fletcher himself released an incredibly fast rendering engine earlier this year, on which I [reported][rep]. I want that one, cutting edge, blazing fast (live preview, that is). Hereby, I stall my fork until nvALT's source becomes available. Maybe I'm able to plug [my desired custiomizations][cust] into this new big thing.